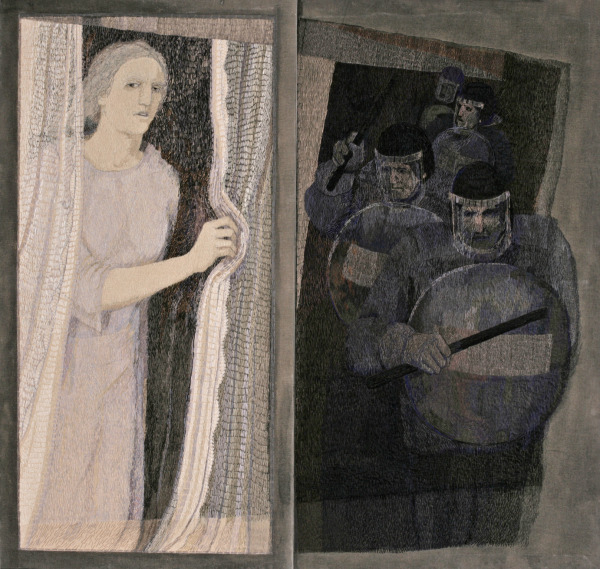 Two joined embroidered panels, one depicting a woman looking out from behind a curtain and the other depicting four policemen. Cotton canvas is stretched over a wooden frame. The canvas has been given a wash of thin acrylic paint to set out the main areas. This stitching all done by hand. Observed Incident, Audrey Walker, 2002, Crafts Council Collecton: T172. Photo: Heini Schneebeli. I am especially interested in the 'narrative' content and after a number of years working on landscape themes I have returned to figurative imagery. This piece was made in response to a tiny fragment of English medieval embroidery in the V&A where a mysterious figure seems to be observing the Martyrdom of St Thomas Beckett. A tribute to the medieval embroiderer who crammed the story into a tiny space and who drew beautifully.